3) Email us at support@askariel.com so we can contact you if you win! Winners will be determined based on the number of Facebook post likes. There are lots of opportunities to win! 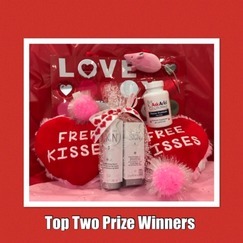 The top two post winners who have the MOST LIKES on our Facebook page will receive the Valentine Grand Prize (valued at $125). Contest Qualifications Winners must be 21 years of age and a US resident. In order to qualify, the photo must include a comment about how Ask Ariel's products, newsletter or nutrition information have helped your pet. If you need help posting a photo of your pet on Facebook, please just email us what you would like to post and we can do it for you. *Likes will be counted through 6:00 pm PT Tuesday February 5th. Winners will be announced Tuesday at 9:00 pm PT.